But bloggers are now demonstrating that all too many of the images that shape the perceptions of Jagger and countless others have been manipulated. 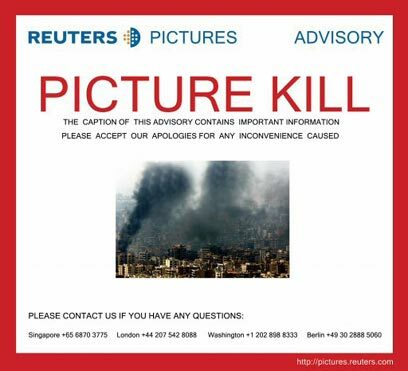 Reuters was forced to withdraw over 900 pictures taken by Adnan Hajj after Charles Johnson of the Little Green Footballs blog exposed the fact that the news agency’s photographer doctored images he had taken of the Israeli/Hezbollah war, darkening and enhancing smoke spirals in the photographs. And more evidence is mounting in the blogosphere that other pictures Reuters has distributed online and to newspapers have been manipulated, also in the direction of presenting Israel as an aggressor. This is not the first time Reuters has been implicated in photo manipulation. Back in 2001, during the first year of the Palestinian intifada against Israel, CAMERA questioned Reuters’ misrepresentation of photographs from the region. The photographs Reuters distributed supported the news agency’s overall theme of Israeli aggressors victimizing Palestinians….until one looked closer. A photo of a Palestinian woman displaying “empty Israeli bullet shells” in her home demonstrated Israel’s attempt to demolish innocent Palestinians’ homes, according to the caption. The problem is, when bullet casings are ejected from the weapon they fall near the shooter, not the target. Thus, the photo was likely evidence that one or more Palestinian gunmen had been shooting at (Israeli) targets from this woman’s house. (See article.) And there were similar examples. Reuters responded to CAMERA’s criticism of its lopsided portrayal of the Israeli-Palestinian conflict by including more photographs of Israeli victims, but the theme of an aggressive Israel was not completely abandoned. And now during the current Israeli/Hezbollah war, with the help of stringers and photographers from the region who provide Reuters with images and descriptions of unfolding events, the news agency’s negative photo message about Israel has intensified. Will New York Times and Other Mainstream Newspapers Investigate? Reuters has withdrawn all Adnan Hajj’s photos (920) from databases. Will the New York Times investigate and write anything about the journalistic scandal? And will any of the other newspapers who have used these photos re-examine how they assess the material they are given? Photographs of Lebanese people are seen among the debris of several houses after Israeli missiles and bombs destroyed them, in the southern village of Srifa, Lebanon Tuesday Aug. 1, 2006. Three square blocks of Hayal Jumma neighborhood of Srifa have been levelled. The Lebanese Red Cross and the Civil Defense workers from Tyre, roughly 10 miles (16 kilometers) away, brought in a front-end loader on Tuesday to try to recover bodies that had been left buried in the rubble since the blistering assault more than 10 days ago. Red Cross officials said it’s estimated 35 bodies are buried in the ruins of Srifa. 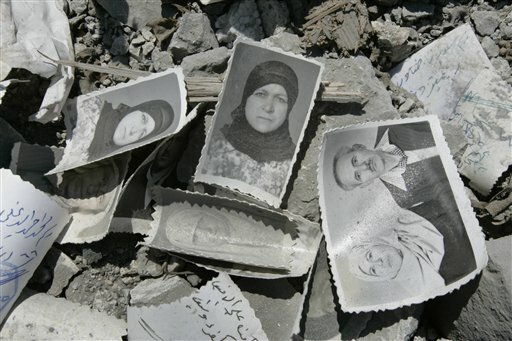 The destruction by Israelis of civilian lives was supposedly evidenced by these photographs of ordinary people found amidst the rubble created by Israeli missiles. But how were such pristine photographs found sitting undisturbed on top of the dirt and rubble—so und isturbed that two copies of the same photograph were found neatly arranged side by side? Is this not highly unusual? And even if it were possible, how often does one find intact photographs sitting alone and undisturbed on top of the ruins of a building levelled by a missile? But coincidentally or not, photographers from various news organizations have been finding just that in rubble all over Lebanon. On July 31, AP photographer Kevin Frayer transmitted this photo of a clean, intact snapshot lying neatly on top of the rubble of a mosque in Qana, said to have been hit by Israel’s missile strike. 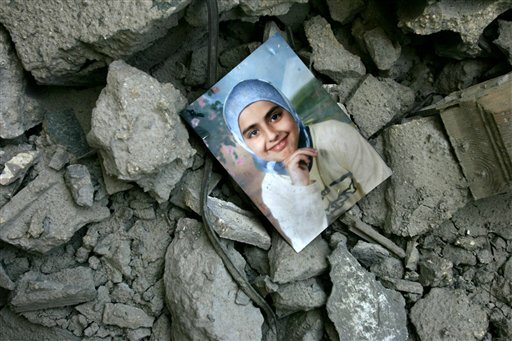 A photograph of a Lebanese girl is seen in the rubble of a mosque that was hit in an Israeli missile strike in the village of Qana, southern Lebanon, Monday, July 31, 2006. 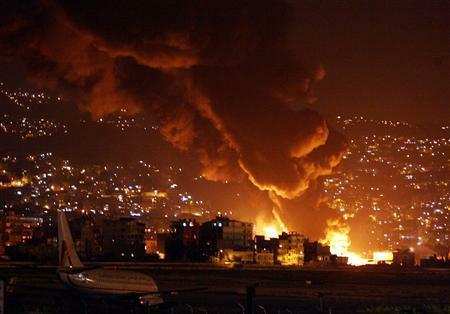 At least 56 residents of the village were killed when Israeli warplanes attacked the village early Sunday morning. 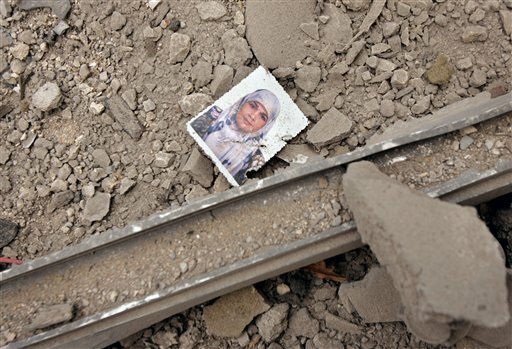 And two weeks earlier, AP’s Ben Curtis sent this image of a passport picture of a Lebanese woman in an area said to have been destroyed by Israel on July 16. While the photo is somewhat dustier and in worse shape than the others, one must still wonder just how many such photographs there could possibly be. 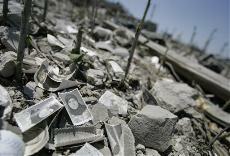 A small passport sized photo of an unidentified woman lies amongst rubble in a destroyed area of the southern suburbs of Beirut, Lebanon Sunday, July 16, 2006. Days of Israeli airstrikes have concentrated on the densely populated residential area housing the now-destroyed Hezbollah headquarters. 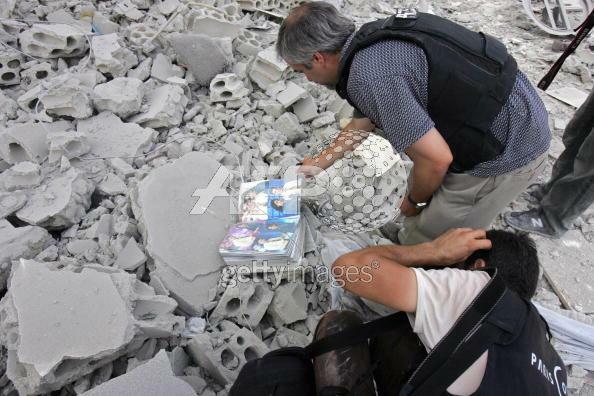 A journalist looks at a family album in the rubble of a building destroyed in an Israeli air strike in the southern Lebanese port city of Tyre 07 August 2006. At least five civilians were killed when Israeli jets launched two successive raids on several buildings in Tyre, causing them to collapse, rescue workers on the scene told AFP. The apartment buildings were situated next to the target of an Israeli naval commando operation last week that was aimed at killing top Hezbollah militants. These are just some of the many photographs of “finds” by photographers working in Lebanon, taken weeks apart in different locations, with the only common denominator that all purport to depict Israel’s destruction of Lebanese civilian life. In light of the Reuters photo scandal, newspaper and photo editors must begin asking harder questions about the photos they receive from the war zone. Is truth being told or are the photographs tailored to the message? 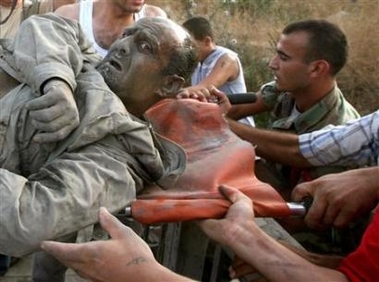 After a July 30, 2006 Israeli airstrike on a building in Qana was said to have killed dozens of civilians, most of them children, Richard North of the British blog EU Referendum studied some of the photographs taken at Qana, arranging them chronologically, with close attention to the details. He raised interesting questions about whether or not any of the photographs were staged and if so, to what extent. It is noteworthy that several of the Qana photographs were taken by Adnan Hajj. Photo editors have expressed shock that anyone would think to question whether the photos of the rescue workers carrying dead children were staged. But it must be remembered that Hezbollah controls the Qana war zone and also controls the information and photo opportunities available to journalists, stringers and photographers. The images of rescuers parading the bodies of dead children around, and holding them up to the camera in a variety of poses raises its own questions. Already it turns out that the originally reported count of over 34 children and 24 adults killed by the airstrike was misrepresented. Instead, a total of 28 bodies were found. 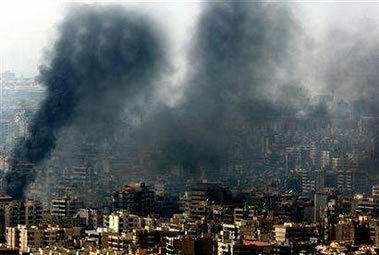 The public is becoming increasingly skeptical of information and photographs coming from Hezbollah-controlled areas. 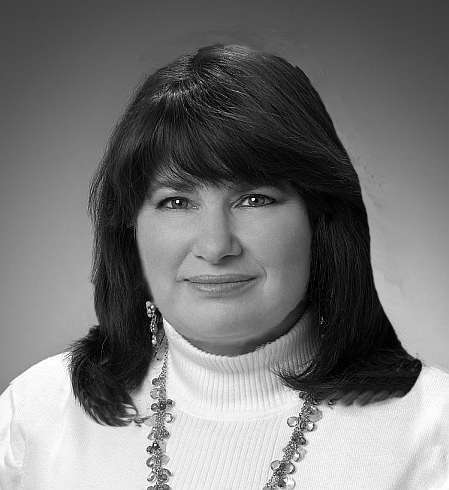 Given the growing number of inconsistencies, news consumers are demanding explanations. It is time for newspaper and photo editors to do the same.